MAIN POINT: The Year 2011 is associated with a year of protests. Christians need not protest like the world. They can do more than protests. They can witness with good works, with good behaviour, and with hope. Even though the world treats you badly, do all the good anyway. This week, many people worldwide will be slowing down to prepare for the New Year's Eve bash. As they prepare to ring in the New Year 2012, invariably many will be reflecting on the past year. All around the globe, stories abound about the joys of victory for winners, and the agonies of defeat for the losers. We welcome new births, and say goodbye to loved ones who died. Some find new jobs while others lose theirs. With the continuing slum in the US economy, and the economic uncertainty worldwide, there seems to be more reasons for gloom. In relationships, some have gotten married to their sweethearts, while some have to annul their marriages through divorce or other kinds of agreements for separation. Students busy with their studies while parents busy themselves with bills and making ends meet for their families. The year has been mixed but many will say that there are more bad news than good. Most of them are stories about politics and power, sports and leisure, and some concerns about environment. They reflect the general concerns of the people. Very little is mentioned about spiritual stuff. Although the Occupy protest movement is #4 in the list above, note that there are other similar movements around the world that produces the protests. There is the Arab Spring protest movements that are continuing to bring down long-time governments and rulers. The death of a boy who committed suicide in Tunisia sparks the Arab Spring revolution. Bouazizi was a 26-year old boy just minding his own business. For a boy his age, he carried huge responsibilities. His meager income basically supported his family of 8 persons. He sold produce on a cart in the market. Along came a female enforcement officer who not only confiscated all his goods but also made derogatory remarks about his father who had passed away. He tried to complain to the authorities. Instead of being given a just hearing, he was ignored, slapped, and pushed away with a challenge to kill himself instead. Bouazizi in despair set fire to himself. He died on January 4th, 2011. 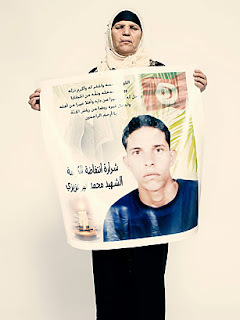 The Bouazizi suicide is the spark that lits up the Arab Spring movement. As Tunisia falls to public cries for justice, the other autocratic regimes quickly follow suit. Egypt, Libya, Syria, and Yemen all have similar uprisings which led to the deposing of their hardline autocratic leaders. In the West, there are protests too, albeit over economic disparity. Even after the US government bailed out large US corporations with public money, the economy did not seem to improve. Main street people continues to question Wall street corporate bigwigs. 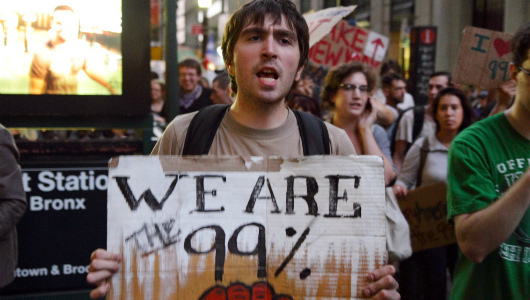 This produces the 99% movement (Occupy movement) where protesters claim to represent the 99% of common folks over the rich guys (1%). Rightly or wrongly, the logic is simple: Corporate greed of the 1% is the cause of the economic problems affecting the 99%. It is no surprise then that Time Magazine this year declares 'The Protester' as the person of the year. C) Ending the Year with a Moan? Psalm 90 has been attributed to Moses. Called the 'man of God,' Moses declares that all of life has been held together because of God's mercy and grace. The generations of Israel have been kept in existence because God has been their dwelling place. The creation of the world has been sustained because God is at work. Time is limited but God is not (Ps 90:4). There is the image of powerful men and women of the day become nothing by the night (Ps 90:5). Due to sin, and the continued rebellion of Israel, God has allowed justice and judgment to follow suit. Without God's mercy, man would have ended their years with a moan. The trouble with the world is this. Man's continued rebellion and disobedience will lead to man ending their years with a moan. The events of the year is less of God's judgment but more of man's failure to come back to God. All over the world, people are more concerned about their own things which lead to widespread corruption, power hungry moods, and a general lack of compassion. Even the protests are symptoms of an underlying discontentment with life. When the economy is good, it is like sweeping the dust of unhappiness under the carpet of good jobs and comfortable materialistic living. When the economy turns nasty, when the carpet of comfort and affluence is removed, the dust of discontentment is revealed once again. Man is sinful, regardless of the state of the economy. Sin produces more sin. It leads to God's wrath. Contrary to what some people think, God is not angry simply because His Law has been broken by sinful people. God is angry because man is setting themselves up for failure right from the start, and chooses to condemn themselves. Man tends to blame everyone else except himself. Playing the blame game, man names all manner of excuses and problems, pointing at everything else except himself. Days of blaming leads to a final puff of moaning. Christians should go beyond protesting. They can do more. Christians have a higher mandate to witness regardless of their positions in life. They can overcome evil with good. Mother Teresa is not a high and mighty queen who can command large military ships or powerful armed forces. She is a gentle and humble lady, serving among the poorest of the poor, with whatever she has. Mother Teresa overcomes the evil of poverty by the good acts of mercy. Dietrich Bonhoeffer stands up against the tyrant Hitler during World War II, knowing that his resistance against the Nazi regime can ultimately mean him losing his life. He protested with boldness for God. Bonhoeffer overcomes the evil of Nazi power with the good of Christlike courage. Recently, the CEO of American Airlines chooses to resign in protest against the 'immoral' behaviour of corporate politics when AA declares bankruptcy. In an age where CEOs who failed their companies can still depart with generous severance pay, Gerard Arpey left AA without any golden handshake. The previous CEO of HP, Leo Apotheker takes home nearly US$25 million after leading Hewlett-Packard through one of the worst performances in corporate history. The ex-CEO of Yahoo, Carol Bartz receives about US$10 million after failing to turn Yahoo around. John Chidsey pockets about $20 million after his failure at Burger King. In an age where leaders are rewarded despite doing a lousy job, Arpey bucks the trend. He has no such financial windfall. He leaves based on an ethical principle, that by declaring bankruptcy, AA is legally free to avoid meeting their obligations. From pensions and medical benefits to negotiations with worker unions, the corporation hides under the legal umbrella of Chapter 11, to walk away from their ethical responsibilities. For Arpey, such acts are immoral. We may agree or disagree with Arpey's manner of resignation. One thing is clear. He lets the desire for doing right, overcome any temptations for doing wrong. We may not be able to control external circumstances, but we can certainly control our inner selves. We can control how we respond to evil. While the rest of the world spins away in their protests and despair about life, Christians can continue to do all the good that they can. They can give thanks rather than complaining. They can do something good regardless of what happens to them. They can trust our dependable God instead of the undependable rulers of this world. As we prepare to ring in the New Year, let us do soul work to prepare to welcome the coming of the Lord. Do all the good that we can. Say all the good that we can. Be all the best that we can. Hope is simply this: When the world around us calls us to give up, to complain and to drown ourselves in despair, hope tells us to 'Give good works another go!"